A safer community, improving service delivery for all citizens and bridging language barriers are key outcomes of the City of Richmond’s Smart Cities Challenge proposal. Richmond and other finalists in the Government of Canada’s nation-wide competition met with the Smart Cities Challenge Jury for the first time this week at the Future Cities Canada Summit. The jury was provided a progress update on the City’s proposal to create an Intelligent Operation Hub that will seamlessly integrate data and coordinate emergency response, while also enhancing day to day delivery of key local services. create scalable mobility systems that enhance daily life and improve emergency response rates and recovery times. 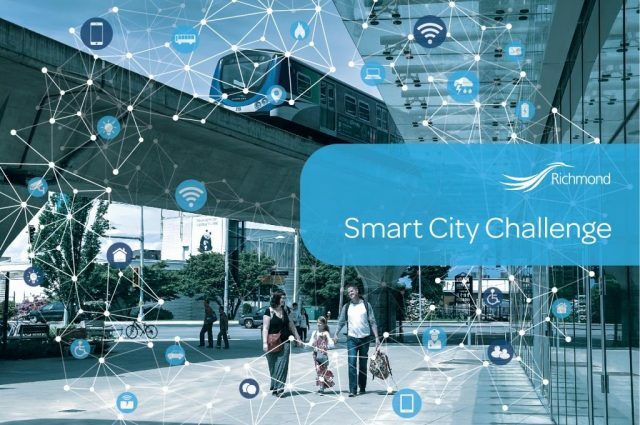 The Smart Cities Challenge is a national competition that encourages communities to adopt a smart cities approach to improve the lives of their residents through innovation, data and connected technology. The Challenge was launched in November 2017 under the Government of Canada’s Impact Canada Initiative. More than 200 communities from across Canada submitted applications. An independent panel of 13 jurors assessed the proposals and 20 finalists were announced on June 1, 2018. Each finalist receives a grant of $250,000 to further develop their innovative ideas into final proposals that outline all design, planning, and project management components of their plans. The final proposals are due in March, 2019 and winners will be announced in spring 2019. Four winners will be awarded with prizes of up to $50 million, two at $10 million, and $5 million. Richmond is a finalist for a $10 million prize in the competition. Richmond has formed a number of staff teams, who are working alongside a variety of external partners from other government agencies and first nations, business and community partners to prepare the City’s final submission. A Smart Cities Advisory Committee with representatives from many of the partners has been formed to help guide this process. The committee includes representatives from the Vancouver Fraser Port Authority, Vancouver International Airport Authority, Emergency Management BC, TransLink, Kwantlen Polytechnic University, BC Institute of Technology, BC Hydro and leading local technology firms including MDA, SNC- Lavalin, Sierra Wireless, TELUS, TIBCO, Aware360, Transoft Solutions, Urban Logiq and Ameresco. Extensive community engagement is also being undertaken to ensure the final proposal reflects the needs and interests of local residents and business. A Smart Cities street team will be participating in a variety of public events to gather input from the community and further engagement opportunities will be offered through the project website and the City’s online engagement platform, LetsTalkRichmond.ca. Details of additional local Smart Cities events will be announced soon. To learn more about the proposal and view a new video debuted in Richmond’s presentation at the Future Cities Canada summit visit the project website at smartcity.richmond.ca. For more information on the Challenge, visit the Infrastructure Canada (INFC) website and follow the event on Infrastructure Canada’s social media accounts: on Twitter at @INFC_eng, #smartcitiesCanada and on Facebook at Infrastructure Canada- English.